Explore the highlights along the mighty Brahmaputra River as you sail on board a luxury cruise boat. Fly from London to Kolkata. Arrive in Kolkata in the morning, transfer to hotel. Afternoon at leisure in Kolkata to relax and acclimatise. Morning transfer to airport. Fly Kolkata to Guwahti (Gauhati). During the morning, visit the temple of Kamakhya. Board cruise boat 'MV Mahabaahu' and set sail to Kiriakara in the afternoon whilst guests are given a safety briefing followed by a welcome dinner. Day spent on boat sailing towards Tezpur, giving you time to relax and enjoy the facilities on-board including a massage in the spa, a soak in the jacuzzi or a swim in the pool. Sail towards Silghat. On arrival, disembark and visit tea gardens for tea tasting and a talk on making the perfect cup of tea! Early morning elephant-backed safari in Kaziranga National Park to hopefully see rare rhinos, tigers and a myriad of exotic birds, followed by breakfast at a resort and then back to the park for a jeep safari. Sail to Bishwanath in the afternoon for a walk around the charming village. Sail from Bishwanath towards Majuli Island. After lunch take a boat safari to the river banks to see the wildlife up close. Return to the boat and carry on to Majuli Island. Cooking demonstration on board followed by a bonfire on an isolated island and dinner back on board. Explore Mishing Village in the morning to meet the locals and experience their way of life. Continue sailing towards Majuli Island. Reach Majuli Island at the end of the day and drop anchor. Morning yoga session on board the boat. Visit Majuli Island, centre of Assamese culture. Visit monasteries. Performance by MajuliI Island monks of Masked Dance. Rejoin boat to sail to Nimati. Farewell dinner on board the boat. Breakfast on board before disembarking to travel to Sibsagar to visit local monuments. Drive to Jorhat airport and have lunch (at clients' cost). Fly to Kolkata and transfer to your hotel. After breakfast you'll transfer to Kolkata for your flight home to London. Fly to Delhi. Time at leisure or sightseeing Old & New Delhi. Train to Ajmer and drive to Pushkar. 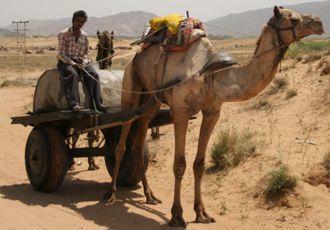 At the Pushkar Camel Fair. Thousands of people and animals travel from miles to attend the fair, including many pilgrims, who come to bathe in Pushkar's sacred waters. 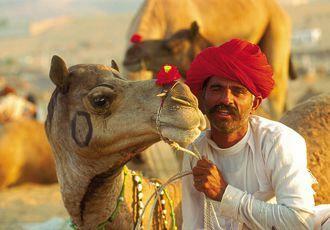 The area becomes filed with musicians, stall holders, snake charmers and of course camel traders. Take the train to Jaipur. Sightseeing including Palace of the Winds. Board the train for your journey to Shimla, via Delhi. 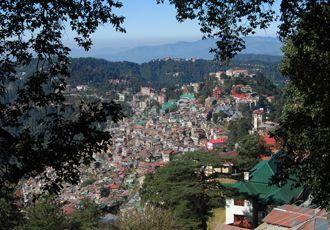 Take the normal train as far as Kalka, then ride the 'Toy Train' to Shimla. Time at leisure in Shimla. Return by train to Delhi. 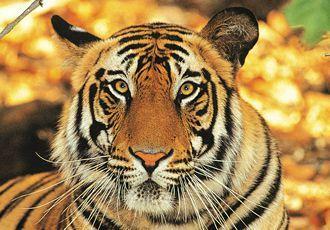 Explore oppulent palaces, fascinating temples, and with any luck, spot a tiger, on this 13-day suggested tour. Fly to Amritsar. Sightseeing including the Golden Temple. Time at leisure in Amritsar. Board the train for your overnight journey to Jodpur. 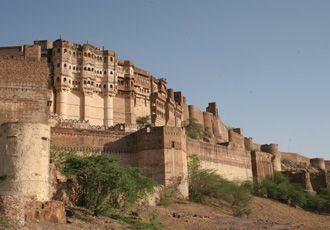 Visit Jodphur Fort and take a heritage walk from the fort down into town. Drive to Udaipur with a visit to both the Jain Temples at Ranakpur and Kumbulgarh Fort on the way. Take a boat ride on the lake to see the Lake Palace, visit City Palace and the bazaar. Drive to Chittogarh. Visit the famous fort, palaces and temples. Drive to Jaipur. 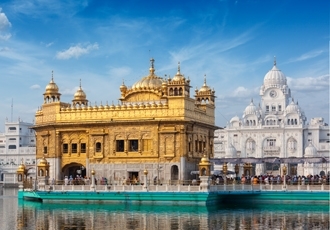 Sightseeing including the Amber Fort, City Palace, Jantar Mantar, Hawa Mahal. Drive to Ramthambore National Park. Game drives in the park, hoping to spot a tiger, and some of the estimated 300 species of birds. Drive to Agra. Full day in Agra with visits to the Taj Mahal, Agra Fort and Fatephur Sikri then late afternoon drive to Delhi (or evening train to Delhi). Transport to the airport for your international flight. Combine gentle day walks in south India's tea estates, with a backwaters cruise and fabulous accommodation throughout. Fly to Cochin, arrive in the early morning. At leisure. Evening sunset cruise around the harbour. Sightseeing in Cochin including St Francis Church, Dutch Palace and the Spice markets. Drive to Athirapally. Take a walk in the forest, or visit a tribal village. Drive to Valparai. Day walk in the tea estate and the nearby forest. Drive to Madurai. Spend the afternoon at leisure. Evening visit to Meenakshi temple complex and the local markets. After lunch, drive to Meghamalai and the Woodbriar Tea Estate. Day walks in the area. Morning drive to Periyar visiting a spice garden en route. Evening game drive in Periyar Wildlife Sanctuary. Enjoy a morning walk with wildlife trackers. Afternoon free for bird watching and nature walks. Drive to Teekoy. Stay at the Vanilla County - an eco-agri tourism project at the foothills of Vagamon. Your accommodation is a home-stay in the hills surrounded by estates of cardamom, spices and rubber trees. Afternoon walk in the estate. Full day walk from Teekoy to Vagamon. Drive to Kumarakom in the morning. Board private rice barge for overnight cruise on the backwaters. 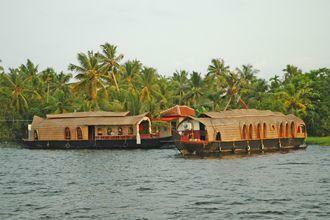 Disembark riceboat at Alleppey and transfer to the Coconut Lagoon Resort. Spend a day at leisure. Transfer to Cochin airport for international flight. Stay in a super luxury camp set at the foot of enchanting Thiksey Monastery whilst you explore the local sights and immerse yourself in Ladakhi culture. Fly from the UK to Delhi. Please ask us about upgrading to First or Business Class. Arrive in Delhi where you will be met and transferred to your hotel. The afternoon is free for you to relax. We can recommend a number of different properties in Delhi – there really is somewhere to suit everyone. Our personal favourites at Mountain Kingdoms are the 5-star Imperial or the 4-star Oberoi Maidens as both are handsome old colonial properties offering excellent service. Or for a more intimate, contemporary feel, The Manor Hotel is set in beautifully landscaped gardens with a croquet lawn, and has a superb restaurant. We suggest spending the morning sightseeing around Old & New Delhi perhaps visiting The Red Fort, walking through the old bazaar of Chandni Chowk and exploring the Mughal gardens of Humayun’s Tomb. The afternoon is free for you to relax, visit the National Museum or indulge in a spot of shopping in Khan Market. Early morning flight to Leh. 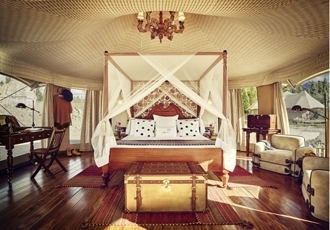 Transfer to the most luxurious accommodation in Ladakh - the Chamba Camp, Thiksey - where you will receive a traditional welcome before being shown to your luxurious suite tents by your private butler. There will be a short introductory tour of the camp, including a walk through the organic garden, and then the remainder of the afternoon is spent at leisure in the camp, acclimatising to the altitude. The cuisine in camp is a delicious combination of Indian, regional and international delicacies, and additionally you will be able to experience a special outdoor dinner and a BBQ during your stay. Optional early morning bird watching with the camp naturalist. Afternoon tour of the fascinating town of Leh, including a visit to imposing Leh Palace and a high tea in a Ladakhi home. Join the early morning prayer ceremony with the monks at beautiful Thiksey monastery, tour the prayer rooms and enjoy the spectacular views down the valley. Return to camp for breakfast with the remainder of the morning at leisure. Optional local cycling tour. Afternoon exploration of Hemis Monastery, the oldest in Ladakh, followed by a cultural dance performance back at camp in the evening. Drive along the Indus River to the fabled monastery at Alchi, returning to camp via 16th century Basgo fort with its copper-gilt Buddha statue. Alternatively, it is possible to combine the visit to Alchi with an optional rafting excursion, gently rafting down the Indus through stunning scenery and passing traditional Ladakhi villages along the way. A morning at leisure to relax and explore Thiksey and the pristine camp surroundings. You will have the chance to join a culinary class with the Chamba Camp chef during your stay, and there are plenty of activities in the camp to try your hand at including archery, croquet and star gazing. Or if you wish to venture further afield there are optional excursions driving to the world’s fourth-highest motorable road - the Wari La, or to breathtaking Pangong Lake, the setting for numerous Bollywood dance sequences! In the late afternoon you can visit the medieval fortress of Stok Palace, residence of the Prince of Ladakh, and take tea in charming Stok village. An early morning start for the scenic return flight from Leh to Delhi. The afternoon is yours to spend at leisure relaxing or enjoying some final sightseeing and last minute shopping. Transfer to the airport, fly to the UK. Or you may wish to extend your holiday to visit the Taj Mahal, or search for tigers in Ranthambore National Park, a former hunting reserve for the Maharajas of India and one of the finest national parks in northern India. Please ask us for details, or for other extension ideas.